One of the B dendrophila snakes I’ve found at night in the tropical secondary rainforest in Southern Thailand, Krabi Province. Description: This is a long, strong snake with a rather pronounced vertebral column. The head is black on the top with bright yellow supralabial scales which have black edges, producing a striking effect. 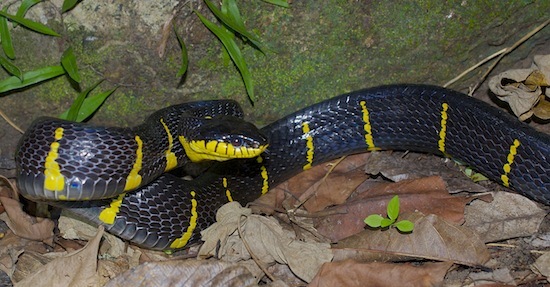 The snake is black on the back and laterals with thin yellow bands extending from the venter to usually about mid-body. It is not common for the bands to meet at the top. Ventrals are very dark grey to black except where yellow from the bands. The eyes are large with vertical pupils. The chin and throat are bright yellow. The inside of the mouth is white. Tongue is dark grey to black. Juveniles of this species are same as the adults. 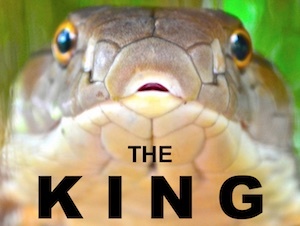 This snake is nocturnal and arboreal, but can often be found on the ground or in bodies of water as well. 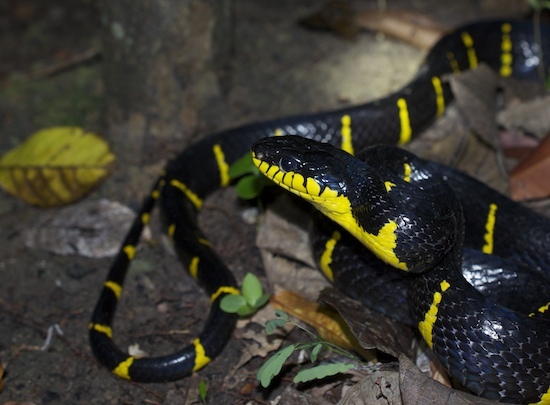 NOTE – there is some danger of misidentifying this species with the deadly Bungarus fasciatus – the Banded Krait. Range: Thailand-wide. Found in humid forests of all sorts, especially near or in trees above streams or other fresh or saltwater up to 610 meters. They can be found resting in branches in daytime above water in the mangroves or on mountain freshwater streams from 3 meters to 6 meters high. Habitat: Trees, land, and water – salt and fresh. It sleeps in many different trees including the leaves of mangrove trees in the mangrove, and on large palm trees. Food: Frogs, lizards, eggs, fish, and other small animals. They can frequently be seen heading upstream along stream banks looking for frogs at night from dusk to midnight or so. Defensive Behavior: These snakes curl up in a double-s shape before striking. They are rather quick to bite. Venom Toxicity: Weak, but with some medically significant envenomations recorded in literature. No confirmed fatalities. B. dendrophila is a rear fanged colubrid. The fangs are not large, and it isn’t easy to get a good bite on a human leg or arm where venom can be transferred. Don’t attempt to hand-hold a snake that is prone to biting. 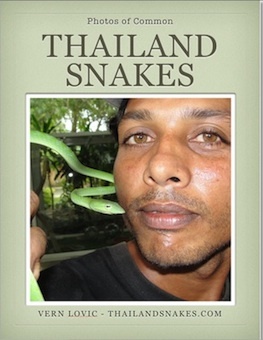 I know a Burmese man that worked in the snake show in Krabi for years, he was bitten many times by this species while on a boat collecting them in the mangroves. At times after being bitten repeatedly he reported getting a bad headache which abated after 20 minutes or so. Offspring: Four to fifteen large eggs. Offspring of 35-43 cm hatch after ~12 weeks and strongly resemble adults in coloration and pattern. Notes: These are great looking snakes with a lot of energy for striking. 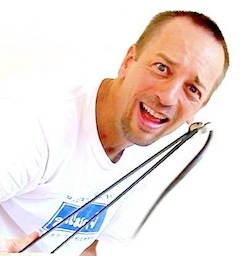 Unfortunately, their look and their energy make them perfect for use in the snake shows across Thailand. It is not uncommon for these snakes to die in captivity.